The water heater specialist's third-quarter earnings were hurt by the rising cost of steel and a slowdown in the Chinese economy. Thanks, trade war. While there are no direct references to the escalating trade war between the U.S. and China in A.O. Smith's (NYSE:AOS) most recent earnings report, the results it posted were peppered with reminders. Higher costs and weakening sales not only led to a decline in earnings, but they also led to management lowering its guidance for the year. Here's a look at the things that impacted A.O. Smith's earnings in the third quarter and what they mean for investors. Data source: A.O. Smith earnings release. EPS = earnings per share. The two things management pointed to as the culprit in this slowdown were steel costs and shipping expenses. Ever since the Trump administration slapped tariffs on steel and aluminum, domestic steel prices have increased considerably. Also, robust economic growth in the U.S. has strained the American trucking market to the point that shipping costs are also up considerably compared with this time last year. While these two things are having a considerable impact on the cost side of the business, management noted that it is also experiencing a slowdown in sales in response to higher prices it put in place to offset these rising costs. As a result, the company's North America segment posted a decline in earnings as well as a 100-basis-point reduction in profit margins. Data source: A.O. Smith. Chart by author. The trade war also hurt the company's China sales. According to management, water heater sales were weaker than expected as the housing market grew at a much slower pace. It was able to make up for the weaker water heater sales with growth in air-purification and water-treatment equipment as well as improving costs in India. Overall, though, it was not A.O. Smith's finest showing. Even though there was a lot of bad news in this report, it wasn't without its bright spots. One of the things that investors should like is that the company remains flush with cash even after repaying $217 million in debt, buying back $100 million in stock, and increasing its dividend by 20% for the second time in 2018. We do not expect sales of water heaters in the U.S. will be as strong as we previously forecasted. Based on our shipments in September, we believe residential water heater industry volumes will be down approximately 100,000 units in the second half of the year compared with last year, but increase by 250,000 to 300,000 units for the total year. Based on year-to-date shipments and a difficult fourth-quarter comparison, we expect 2018 commercial water heater industry volumes will decline by approximately 5 percent compared with last year. We believe our China sales will continue to be negatively impacted by significantly slower housing growth caused by deteriorating consumer confidence related to a weakening economy and international trade issues. We expect sales in China in local currency to grow approximately 3 percent this year. 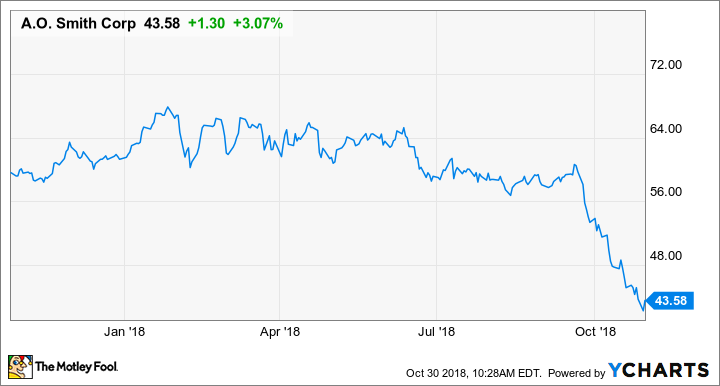 Management revised its 2018 earnings per share guidance down to a range of $2.57 to $2.60, and said that revenue will only be 7% higher than the prior year. The challenges that A.O. Smith faced this past quarter are all things that are more or less out of the company's control. So it's hard to get too upset about these results. There's no telling when some of these trends reverse, but one constant that investors can rely upon is the fact that the North American market is largely a replacement business that remains incredibly consistent throughout economic cycles. Also, even though it is facing some hurdles in China, it is looking to gear up operations in India to take advantage of a lot of the trends that made it so popular in China in the first place. The market has not been kind to A.O. Smith's stock, as it is down 25% for the year. Based on management's revised guidance, the stock is trading for about 17 times 2018 earnings. That is the lowest this stock has traded in over five years. It would appear that the market is anticipating the company's results will get much worse. It's possible that a continued trade war will hurt the company's earnings. But the water heater replacement cycle in North America -- coupled with a great balance sheet and a good management team -- suggests that this is an overreaction and could be an attractive buying opportunity.